On July 16, President Barack Obama made his own visit to “the least” of these in prison — at the El Reno Federal Correctional Institution Oklahoma City. 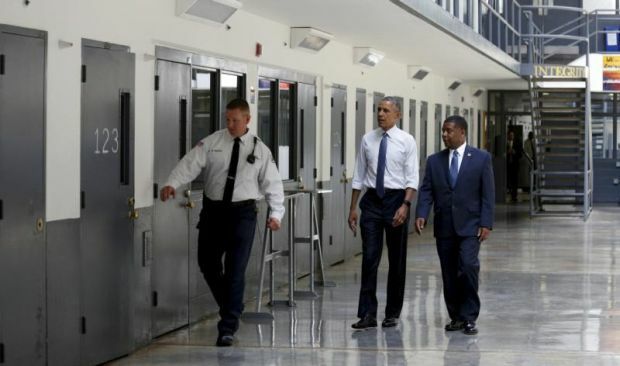 It was historic, being the first prison visit by a sitting president. Three days earlier he commuted the sentences of 46 federal prisoners. Polling may show that Americans are roughly split on Obama’s overall job performance as president, but his visit to El Reno and the commutations show evidence of an emerging consensus that sentences are too harsh and that many prisoners are locked up for far longer than necessary. Obama’s commutations, two more than he’s given over the rest of his presidency, take effect Nov. 10. The inmates being released are all nonviolent drug offenders who were given lengthy prison terms when Congress, in a cyclical tough-on-crime mood, changed sentencing guidelines into mandatory-minimum jail terms. That mood may be changing on Capitol Hill. The sentences — which judges had no discretion to shorten — filled the nation’s penitentiaries to overflowing. Prison construction became the quick fix of economic stimulus for small towns battered by economic setbacks or stagnant crop prices. Private companies also got into the act, often housing convicts hundreds of miles away from their homes so families couldn’t see them. The prisons even charged exorbitant prices for collect calls from faraway family members. As Karen Clifton put it, “The United States has 5 percent of the world’s population, but 25 percent of the world’s prisoners.” She is executive director of the Catholic Mobilizing Network to End the Use of the Death Penalty. Clifton, speaking to Catholic News Service from Chicago, where she was attending a conference on restorative justice, said she is assembling material for a workshop on implementing restorative justice at the parish level in time for next year’s Catholic Social Ministry Gathering. Restorative justice emphasizes the repairing of harm caused by unjust behavior. Unlike the lock-them-up-and-throw-away-the-key model of retributive justice, restorative justice holds offenders accountable, while simultaneously trying to redeem their broken situation. It is an acknowledgment that true justice is difficult work, but that the value and dignity of all persons involved is worth the effort. Mike Riggs, director of communications for Families Against Mandatory Minimums, was excited about Obama’s actions. Riggs said he would like to see more traction on the federal Justice Department’s clemency initiative announced last year. Under its terms, clemency can be invoked for federal prisoners if they likely would have received a substantially lower sentence if convicted of the same offense today; are nonviolent, low-level offenders without significant ties to crime rings; have served at least 10 years of their sentence; don’t have a significant criminal history; have demonstrated good conduct in prison; and have no history of violence prior to or during their current imprisonment. He added that “they can apply for a job but they may not get past the ‘slush file,'” slang for the wastebasket in which a lot of job applications are tossed once someone sees a checkmark next to the question, “Have you ever been convicted of a felony?” To date, 17 states and 52 cities have passed “ban the box” laws forbidding employers from asking the question. Mandatory minimums are one end of the prison spectrum. At the other end is the mandatory maximum: the death penalty. The day of Obama’s prison visit, two bishops issued a joint statement against capital punishment: Cardinal Sean P. O’Malley of Boston, chair of the U.S. bishops’ Committee on Pro-Life Activities, and Archbishop Thomas G. Wenski of Miami, chair of their Committee on Domestic Justice and Human Development. No one could agree more than Marc Hyden, founder of Conservatives Concerned About the Death Penalty, albeit for different reasons than might be argued by the bishops. Hyden cautions against questioning his conservative bona fides, as he used to work for the National Rifle Association. He said he’s welcomed at the Conservative Political Action Conference, Tea Party and Republican Party events. “I’m mobbed by conservatives who thought they were the only conservatives who were against the death penalty,” he said. But for each step forward, there is a step back. The Supreme Court ruled this summer to uphold a drug protocol used in executions that was challenged as cruel and unusual punishment. And a petition effort is underway in Nebraska to repeal the death penalty ban enacted earlier this year, after the Legislature overrode a gubernatorial veto. “We as Catholics have to meet people where they are on their journey. People are at different places, and it takes a lot to be able to forgive,” Clifton said of the Nebraska effort.